The US and the UK have circulated a new draft resolution to United Nations Security Council members proposing a bigger role for the UN in Iraq. Under the plan, the UN would get a wider mandate, to help promote political reconciliation in Iraq. The UN has had a low-key presence in Iraq since a truck bomb devastated its headquarters in Baghdad in August 2003. Diplomats say a vote on any resolution will happen by 10 August, when the UN's existing mandate in Iraq expires. This draft resolution comes days after meetings in Washington between President George W Bush and the British Prime Minister, Gordon Brown. The draft resolution calls for more UN involvement in helping refugees to return and managing humanitarian aid and helping the entire national reconstruction effort. It also points out the importance of armed protection by mainly US forces for any enhanced UN team on the ground. 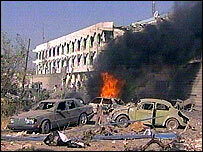 Former Secretary General Kofi Annan pulled all UN international staff out of Iraq after the top UN envoy, Sergio Vieira de Mello, and 21 other people died in a huge explosion at the UN headquarters in Baghdad in August 2003. Should the UN have a bigger role in Iraq?